Mr. Carlos Alfaro’s experience and interest in politics position him in a great viewpoint from which to analyze political scenarios and their accompanying economic waves. Clients worldwide have praised this advice. Legal Risk analysis is deemed to be a key element for decision-making indirect and financial investment. It is part of our firm’s culture to provide our clients with insightful forecasts of the regional environment. We believe that this tool is key to any investment or transaction in any country. 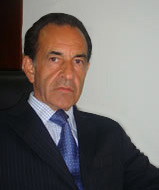 Mr. Alfaro has also accumulated an invaluable knowledge in Government Contracts and the regulatory issues involved. His long-standing career representing national and multinational corporations, lending institutions and banks have made him a referent in the legal circles. Of particular importance is the fact that this experience represents more than thirty years of legal practice in different economic and legal environments (inflation, hyperinflation, deflation, major devaluations, currency boards, etc.) and governments in which risk allocation and protection require legal, economic and political expertise.